It's been a great start to the year for Apple. The stock has risen 16 percent in 2015—crushing the S&P's performance. And some analysts say the Apple Watch, set to be formally launched on Monday, will serve as yet another positive catalyst for the tech giant. But others are more skeptical. And for Dan Nathan of RiskReversal.com, since expectations around Apple have grown so heady, it might be time to seek out protection for one's shares. "We know that there's a lot of catalysts, and we know that stocks that disappoint sometimes with high expectations can go down a lot," Nathan said Friday on CNBC's "Options Action." Widespread "complacency" should lead traders to "consider some other strategies," Nathan said. Nathan's preferred method for protecting one's shares is putting on an options trade known as a "collar." The strategy entails selling an upside call and buying a downside put. Since a put grants its owner the right to sell a stock for a given price and a given time, the shares will be protected below that put's level. Yet on the upside, the trader will be forced to sell Apple shares at the level of that call, even if it rises well above there. "You would do this trade if you think there is the potential for a massive move to the downside over the next few months because all of these catalysts don't pan out—but you really want to participate in some further upside," Nathan said. However, not everyone agrees this strategy is wise. 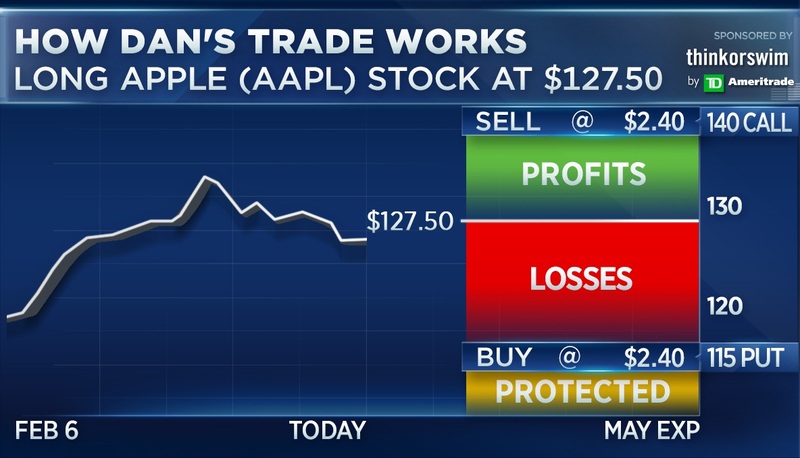 By the work of options expert Michael Khouw, there is a markedly low chance that Apple shares spend too much time below $115, meaning buying the put is likely to be a waste of money. "With 5 percent free cash flow yield, there's a lot to support this stock here. ... If this thing gets down into those levels, then there's probably a lot of people who would reach out and buy it," Khouw said. "I think the downside here is probably pretty muted for Apple." However, Khouw does advise selling the upside calls to generate extra premium. On the technical side, Sterne Agee chief market technician Carter Worth skews bullish on the name as well. "What's not to like? It's a steady, orderly uptrend. It's not too hot, and it hasn't rolled over," Worth said. "The benefit of doubt is with the bull, the burden of proof is with the bear."